The following documents my attempts to find and observe comet C/2006 P1 Mc Naught during the cloudiest weather I have ever witnessed. Despite several failed observing sessions I finally succeeded in making a number of observations of this rare and spectacular comet!. This evening would be my first official attempt to track down C/2006 P1 Mc Naught. The comet was currently located very close to the Sun in the evening twilight in Scutum and would require a very good horizon. This was a beautiful clear sunny Winter afternoon. Conor McDonald arrived down at my house shortly before sunset which usually meant we would be undertaking some kind of astronomical observing or photography so now it was just a matter of waiting until the correct time. Together we watched the end of a martial arts movie I had rented from the video shop (if you want to know the name it's called ''Warrior King'') which ended just as the Sun was setting. To increase our chances of success we needed to narrow down exactly where the comet was in relation to other bright fixed stars because even though P1 was a fairly bright comet at this stage it was nowhere near the incredible magnitude it would obtain during mid January, and besides, that was two weeks into the future and during this stage we expected to lose the comet in the days ahead as it vanished into the solar glare. 4) A combination of all the above. However, another important factor is the comet's elongation from the Sun which will define how well we see it. Mc Naught's elongation was small so we were not expecting anything spectacular. A fuzzy patch with a bright centre was what I pictured in my mind. Before we took things further I logged onto my computer and opened ''starry night pro'' (desktop planetarium software - SNP) to note the comet's exact location. The bright star Altair and planet Venus would serve as my bright guide posts to the comet. Conor and I then walked through my neighbourhood and over the brow of a hill and on the other side we found a good location over some grass wasteland which gave us a good vantage point facing SW. Dusk had descended on us, it was cold, calm, with a light frost, T=8, and high in the east was the waxing gibbous Moon in Taurus just 10 degrees west of the Pleiades star cluster. 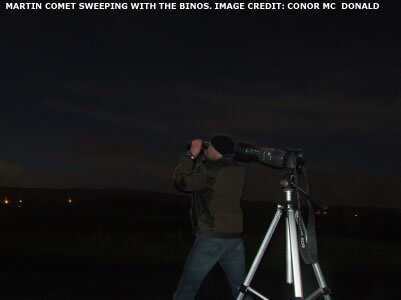 Using my 10X50mm binoculars (B50) I did a careful sweep through the twilight which revealed nothing, I repeated the sweep several times and came to the conclusion that the twilight was just too bright however I was convinced that had I a small telescope with me I could have picked the comet out from that dark blue canvas easily. Several observers had struck success from other parts of the world using digital cameras so we decided to give it a go. 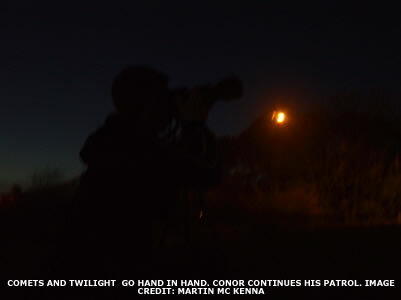 Conor and I set up our cameras on tripods and zoomed into the area of the sky where the comet was suspected to be and took a large number of patrol images. During the hunt for this tailed star we were being hunted by another tailed predator. A black Cat hiding in the long grass had been watching our endeavor intently, it ended up following us everywhere. We ended up making a new friend. By 18.00 UT the comet had gone below the horizon so we ended the session. During the walk home we spotted the International Space Station as it emerged over the tree tops in the SW so I quickly set up my camera and took a number of images as it passed. My best image captured the ISS, Moon, and M45 in the same frame. 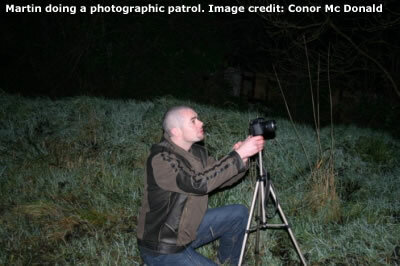 When I arrived home I downloaded my patrol images onto the computer and reviewed my captures in detail. Most showed nothing however I did pick up a suspect on two separate images in sequence taken at 17.17 UT which portrayed a white circular cometary haze at Mc Naught's location perched above a dark cloud bank, which covered the suspect on the third image. The image quality was poor and only the high resolution images showed this object at its best but it was really inconclusive. It could have been the comet but there was not enough evidence to convince me. At mag + 3.9 I'm sure it would have been more distinct. So my first attempt for the comet was a negative one however we were not going to give up yet. New Years day. Cold, calm periods, occasional cool bitter gentle breeze, clear sky with periodic dark gray passing cloud cells drifting to the NE, T=8, Moon two days after full in Taurus, scattered showers with icy rain at times with convective activity. 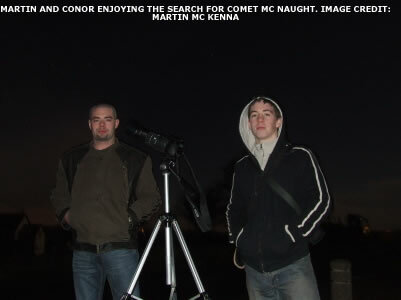 Conor and I had been chatting over the phone before sunset and very soon we had arranged a second observing session with the intention of finding comet Mc Naught. The comet was VERY low in the SW in Scutum below the open cluster M11 only 15 degrees from the Sun. We really needed the best horizon we could find locally which could be reached quickly and we knew just the place. One mile outside Maghera, along the gently curving country roads, stood a large hill which boasted the highest and most incredible panoramic view of the horizon, in fact, the only place higher would be the distant mountain tops in the south. I knew this area extremely well and could have walked to it blind folded. When I was younger my friends and I used to race down this hill on our mountain bikes with the warm Summer breeze blowing against our faces as we gasped for oxygen. During other years we would hike on foot through this area to seek a location to set up our tent, again on Summer nights (ever see an aurora through the opening in a tent? - it is great! ), and on later years a group of us would encounter this very steep hill with dread during every dark unforgiving Winter evening as we completed our nightly five and ten mile runs as part of our boxing and Ju-Jitsu training (it gets easy with practice) which gave me a chance to appreciate what a proper dark country sky should look like. I recall seeing a large piece of space debris burn up with incredible variations in colour during one of these runs, it was easily as bright as the full Moon and almost seemed to land in a nearby field behind the hedge on my left hand side which momentarily took my mind of the run. It was the most spectacular piece of debris entry I have ever seen to date, however none of my friends had witnessed the event, perhaps it was just meant for my eyes only. The plan was simple. I would start walking out the road and Conor and his Dad would meet me in the car then we would get a lift to my special summit. We would be there in five minutes. Meanwhile I located my red rucksack and packed in my digital camera, tripod, and B50. I really wanted to bring my portable 90mm ETX but the scope was just too heavy and refused to fit inside my rucksack. I opened the front door and was greeted by a sudden torrential downpour which stopped me dead in my tracks. Most people would have given up hope by this stage but I decided to wait out the rain. After some time the clouds began to break and the rain stopped so I grabbed my gear and walked out of the house at a swift pace heading for the country road but I never made it that far as my eyes caught sight of a rapidly developing Mammatus cloud display!. To some people clouds may seem boring however if you have never seen a Mammatus display before then I can assure you that you will change your mind. These clouds consist of large pouches caused by sinking air which hang down from the sky like giant bags. They actually do look like breasts or udders and I can tell you it's a very strange sight in the sky. This Mammatus display arrived very quickly at high speed heading to the NE and very soon had covered much of the sky with many dark pouches measuring 20 degrees in diameter (40 Moon diameters - largest I have seen) and because it was 17.00 UT I noted that this was the first time I have seen such a sight under a dark sky, it was very surreal I can tell you. I took a number of images and once the display moved off I continued on my walk to the country road where I met my lift. Conor had seen the Mammatus display also and we talked about the finer points of the show then we arrived at our destination on top of the country hill. On years past, on the peak of this hill, off the road side, stood the spooky remains of a tiny ancient house which lay in ruins. We believed the place was haunted when we were young but now a grand modern house had been erected in its place with a long gravel path leading out onto the road. I felt like we were trespassing as we set up our gear on the gravel bay outside the dark gates but we had no choice as passing cars would have put us in grave danger had we decided to stay on the road. The first thing that I noticed was the temperature, it was absolutely freezing!. The combined wind chill from this high elevation cut through every fabric of clothing penetrating us to the bone. My bare hands shivered and ached with pain which made it difficult to attach the camera to the tripod but after several failed efforts we got our gear in action. The view here made it all worth it!. 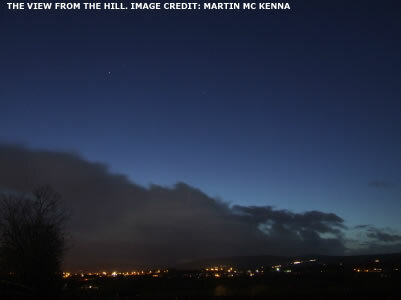 On the distant horizon we could see the dark outline of Slieve Gallion mountain range and above it in stark contrast was the darkening blue dusk sky with the first stars of the night on view. Altair pointed to the location of the comet which would be just above the mountains and now at mag + 2.5 to + 3.0 it was getting brighter and easier to see. The Moon was a glorious sight above the trees in the east and several times we noted the passage of a bright Iridium satellite flare as the low Sun caught a reflective section of the satellite's body before it faded from view as it entered the Earth's shadow. Once our eyes adjusted to the sky I did another sweep with B50 without success so we decided to begin another photographic patrol. Conor used his Canon 350D with 300mm telephoto lens to get in close and I used 10X optical zoom on my Fuji S5600 using Altair to achieve a good focus. We took many images, experimenting with a variety of settings, however our quick checks on the LCD screen revealed nothing at all. We got some very strange looks from passing cars and some of them even returned several times for a nosy at what we were up to. Perhaps they thought we were working on behalf of the BBC with all our cameras and tripods set up, taking images with strange strobes of green and red light catching the attention of anyone who cared to look. No comet seen tonight however the session was an enjoyable one all the same and a great way to start a new year of observing. Finding comet Mc Naught was turning into an obsession with me I had to admit. I was determined that I would not let this comet escape detection and decided that I would try my very best to see it, no, not try, I made a vow that I would see it no matter what it took. Wanting to use a telescope I decided to remove the optical tube assembly of my 90mm ETX M.Cass telescope from its fork arm mount which took some effort as I had to do it by hand as I had miss placed my allen keys which came with the scope, however once I succeeded it made a world of difference. The OTA was so much more compact and light weight that I could now fit it inside my rucksack with ease, and better still, it attached easily to my camera tripod so all I needed now was a clear sky. Unfortunately since December N. Ireland had been experiencing its worst spell of cloudy weather since I began observing over a decade ago. I disagree with most people who complain about the cloudy weather in this country as I simply have yet to experience it. 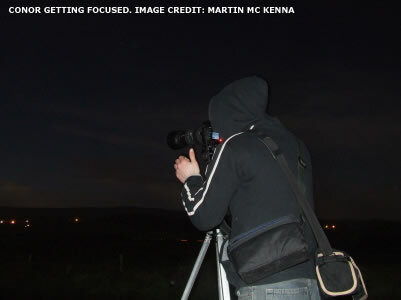 On average we do get a large number of clear nights here in Maghera perhaps due to the proximity of the local mountains?, however the close of 2006 and the start of 2007 was a big exception to the norm. Before Christmas it was freezing fog, followed by rain, gales, and storm force gusts which felled trees, and now it's back to mild wet overcast evenings, not good when you have a window of only 60 min's in every 24 hours to find a comet! This evening was no different. I was waiting for sunset however my hopes were low as the evening sky outside was overcast, dark, and with light drizzle. It was just after New Year and things were quiet so I decided to relax and enjoy ''Back To The Future Part 2'' which was playing on free view. After some time I noticed a few clear gaps forming in the cloud so I grabbed by coat and gear and swiftly relocated up to the site again where Conor and I had completed our first attempt on December 30th. I set up the scope on its tripod which leaned to the side on the uneven soggy wet ground, the light drizzle felt much worse than it looked due a gusty breeze which rocked the scope from side to side causing the FOV to wobble. Behind me the full Moon rose in the NE surrounded by a colourful corona so I turned the scope in that direction. The 40mm eyepiece I used gave a low magnification of 31X and the Moon's disk could fit inside the field twice over so I new the apparent FOV with this combination was 1 degree. Now there where good clear sections in the SW, W, and NW. I began a search for Mc Naught with the scope and 8X21mm finder through southern Aquila, sweeping so low that lamp posts and rooftops would enter the field from the bottom however I could find nothing. I repeated the search this time with the wider field of B50, again without a hint of the comet. 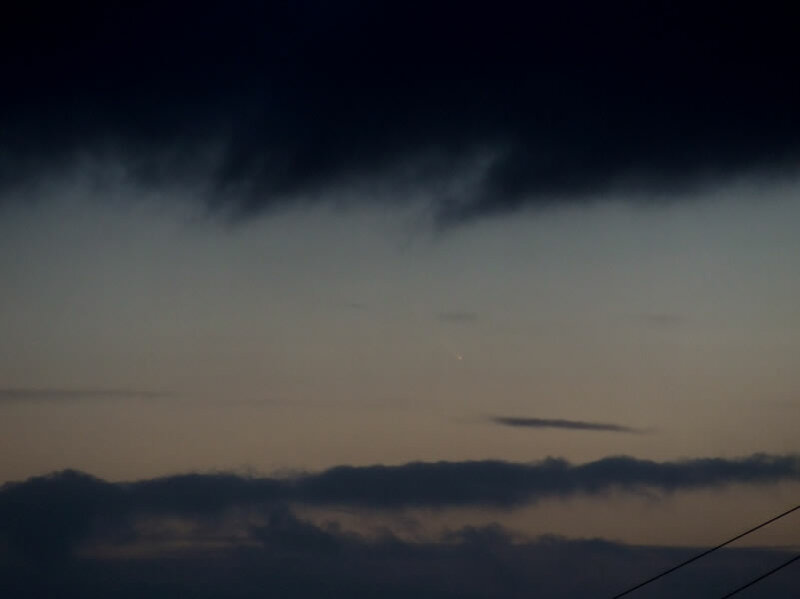 A quick naked eye check revealed that a slow, dark, NE moving cloud bank had covered the comet's location with a massive sheet of stratus cloud coming from behind, this evening's attempt was over. The weather forecast was still very bad but I had to remain positive. My chances of seeing comet Mc Naught had now increased by 50 % due to the comet's proximity to the Sun. Now it was visible both in the evening sky after sunset and again in the morning sky before dawn low in the east. I set the alarm on my mobile for 06.45 UT and it went off. Waking up at this time is a nightly routine for me as I always rise before dawn throughout the year to undertake my own search for new comets when the Moon is not bright. I was feeling very tired and dehydrated however my desire to see the great comet over ride these sensations. I pulled across the blinds from my east-facing bedroom window to be greeted by dark SE moving clouds. I decided to stay awake and resist the temptation to return to my cosy welcome bed so I periodically checked the sky, and just when I thought all was hopeless I detected several growing clear gaps. I got out of bed, changed quickly into warmer clothes catching a glimpse of planet Jupiter and Antares through the pane, then disappeared down the stairs grabbing my gear near the door and headed up the site to a slightly different location which provided me with an excellent view of the eastern horizon. The sky was very clear with the exception of one large dark cloud bank which hung over the comet's position yet again. The full Moon was prominent low in the west above the electric pylons in the site so I had a quick look at it through the ETX to check focus. I then began a sweep through the east above and below that cloud bank with the scope, B50, and naked eye. I could see the bright star Altair wink on and off in the cloud however the comet, which was located to the far west of this star in a horizontal line, was obscured. The bright morning twilight seemed to sneak up on me from nowhere and by 07.25 UT the sky was too bright to detect the comet. This was my fourth failed search and the second within a 24 hour period. I was beginning to wonder when my luck was going to change!. I read somewhere that luck was when preparation meets opportunity. I had the first part of the equation in abundance and now all I needed was the opportunity. It was a hard pill to swallow when I read the next day that observers from clear parts of the world could see the comet with the naked eye at magnitude 0 before dawn. It was from this point forward that I was to lose alot of sleep over comet Mc Naught. Beautiful calm sunny Winter's day. Before sunset I had been chatting with well known local astronomer John McConnell over the phone discussing in detail our plans this evening to find the comet as the sky looked promising. An amazing collection of Virga (Jelly fish clouds) appeared covering the entire sky with the exception of the east. These white clouds all sported long tails which hung down from their altocumulus cloud bases consisting of evaporating precipitation which does not meet the ground. They formed a very creepy sight particularly in the west where they had gathered in greater number so I couldn't resist snapping a few images from the front door with one hand as I talked with John over the phone. After sunset dark slow moving clouds arrived creating overcast conditions. Not giving up I gathered my gear together and walked up to the top of the site and waited for the sky to clear. Suddenly, as if someone turned a gigantic tap in the sky, the rain began pouring down and within minutes I was soaked to the skin and I'm sure I must have looked a sight to passers by who must have thought I was a weirdo, I felt like shouting across saying '' it's ok I'm looking for a great comet'' however I'm sure that would have only confirmed their thoughts about me. Just as suddenly the sky cleared above the horizon so I took out the gear and began a visual search. It was still drizzling overhead which quickly accumulated on the objective lens of B50 and the ETX to the point were I could not see through them so I had to resort to cleaning the lens with the inside material of my coat which is not recommended if you value your optical coatings.  By now the sky was completely clear however yet again a cloud hung over the comet, very frustrating!. 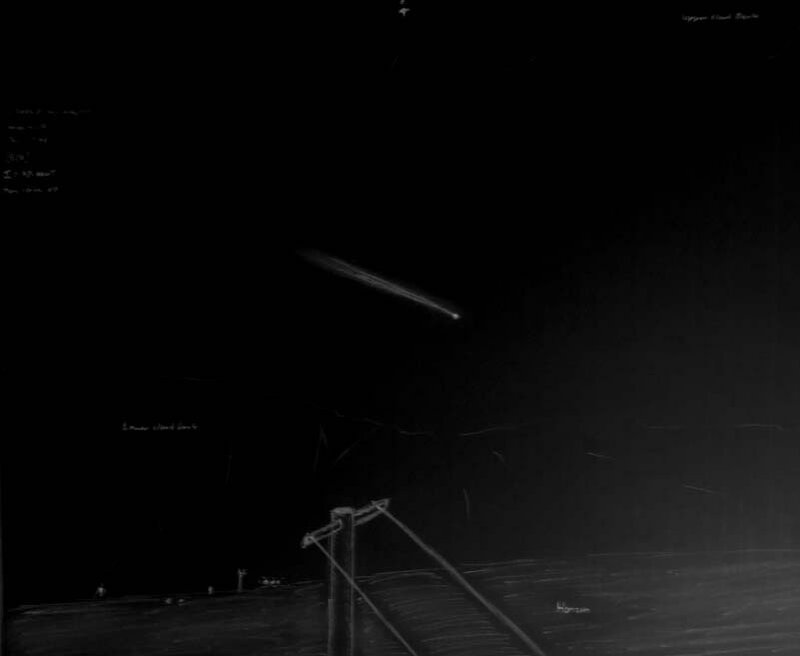 The situation remained the same for the remainder of the comet's visibility window. I took a number of images of the area anyway however the cloud remained my enemy. Calm, cool, very wet, T=8/10, semi dark sky, Moon two days after full (not visible). This was a very tough and wet session however I enjoyed it anyway. My 5th attempt. My alarm woke me at 06.45 UT. I instantly shot out of bed and parted the blind covering my bedroom window and the sky was clear!. I changed at a speed which must have been a new world record and swiftly descended the stairs not caring if I disturbed everyone else in my home who were until now, still fast asleep. I grabbed my rucksack containing B50, ETX, camera, and tripod then headed outside. I ran across the dark muddy ground pitted with puddles and holes like a mountain goat which were invisible to me as my eyes had not yet adapted to the dark, I was driven more by instinct and a desire to see the comet. I arrived at my location facing east and set up my gear gasping for breath. It was a calm and quiet morning except for the bad singing from a drunk who was walking up the Coleraine Road, however he was soon gone leaving me and sky to get on with our business. Good large clear sectors where present, T= 8/10 with broken slow east moving dark cumulus clouds. I adjusted to the night and waited for the comet to rise. I took a few test images of the eastern horizon to gauge what camera settings would best suit this sky while in the SE Jupiter begged for attention beside Antares in Scorpius. I took a few images of Jupiter to achieve focus, the planet was very close to the star Omega Ophiuchi. Then my eye caught a spectacular Iridium flare in the NE sky moving through Cygnus from NW - E. The flare reached an incredible magnitude - 7.0 like a brilliant silver supernova which cast obvious shadows on the ground. As it began fading I managed to guide my camera in that direction and caught an image before it vanished from view. Meanwhile I continued my visual and photographic hunt for comet Mc Naught however yet again a cloud hid the visitor from view. Soon the sky was too bright and the only celestial body I could see was Jupiter so I had to end the session at 08.10 UT. The comet was now being reported at magnitude -1.0 making it a truly brilliant naked eye object in the same league as Hale-Bopp and Hyakutake. I had a feeling that my time had come to see Mc Naught so I just had to keep trying and never give up. Statistically we should get a proper clear sky soon. My 7th attempt. I could not sleep at all tonight so I was wide awake when my alarm went off at 06.40 UT. I glanced out of my window however the sky did not look promising at all though. I did see a few small scattered lighter patches in the clouds with a few stars, and that was all I needed to see!. I was out of bed and back at my location with the gear all set up within minutes. The night was mild, very wet, muddy, calm, with the occasional short duration gust of wind, large dark gray NE slow moving clouds with several small clear gaps. A shower fell on me, stopped, then the sky began to clear with larger gaps growing. I did a naked eye dome search incase a bright Nova had appeared, average to poor transparency, murky/hazy around the last quarter Moon in the south between Leo and Virgo. I could see a bright 22 degree Moon Halo with bright Upper Tangent Arc. Jupiter was eye catching as always so I took a few images of the planet then with B50 I observed Jupiter, M13, and the cataclysmic variable stars 'R' and 'T' Crb. I spent considerable time taking images of the eastern sky and sweeping with B50 for the comet however you guessed it, a cloud covered the comet. By 08.00 UT I had to end the session. I took the long walk back home which took me on to higher ground and I realized that my chances of success would be much greater from this location. From here I could literally see tight to the horizon gaining an extra 10 degrees lower than my usual spot so I promised myself that I would observe from here on the next clear morning. I had a good feeling about this location as I had a lot of success from it before where I had obtained my best aurora image and took hundreds more of the stunning Noctilucent clouds which graced the Summer sky during 2006. 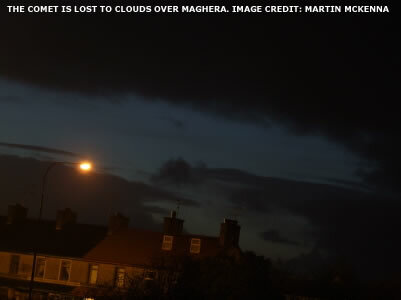 After my pre-dawn McNaught search I checked the morning weather forecast and was delighted to see that this afternoon and evening would be clear across western N. Ireland. 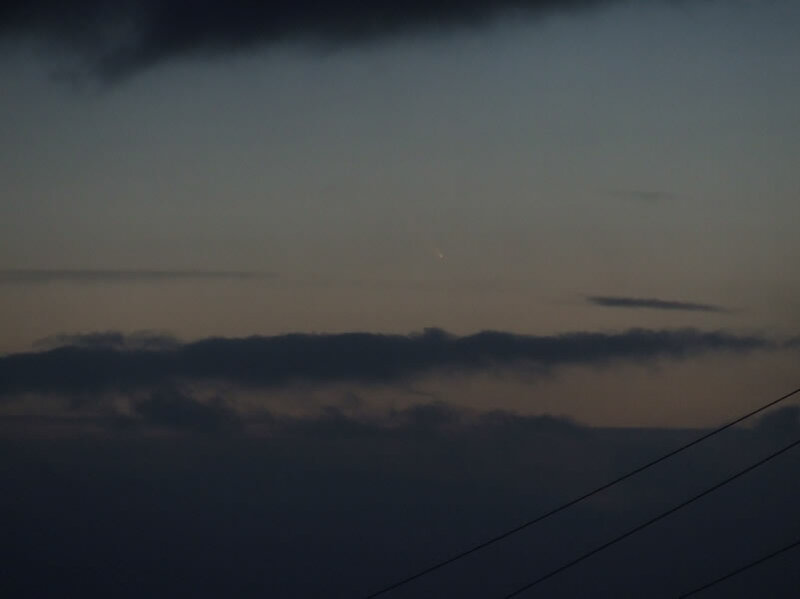 I had a strong feeling that I would catch this comet after sunset! The sky was sunny, 97% clear, with a few scattered slow east drifting cloud strips and cumulus low in the S and SW horizon. I packed all my gear into the ruck sack and prepared to leave at 16.00 UT, glancing out the window I could see the Sun setting over a distant hill with a very bright vivid gold Sun Pillar. At 16.00 UT I put on my coat, grabbed my kit, and began my walk up the site. The Sun was still setting so the environment was very bright and I felt a little apprehensive about people seeing me, however deep down I didn't care. I walked off the path onto rough ground where I had done my previous evening sky Mc Naught patrols, here the ground was marsh-like, wet and soft, which was a good place to set up the tripod to minimize vibrations. I set up the gear beside a hill of grass and waited. I got the feel for the sky and immediately began sweeping with B50 above the left of the sunset glow hoping to find Venus as this would be my guide post to the comet. This evening the comet was located 18 degrees west of Venus and the same distance south of Altair. A very nice formation of Lenticular Clouds appeared above the mountains to the SW. A number of neighbours walking by gave me strange looks however I paid them little attention. At 16.15 UT I spotted planet Venus as a white mag - 3.7 unwinking ball in the South so I took a few images to get my focus then began a visual search west of the planet with B50 and the ETX. 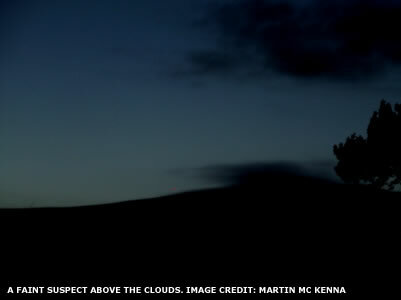 I was getting worried as a dark cloud formation had appeared on the horizon and was heading slowly for my target area. WOW!! !..at 16.40 UT I found comet Mc Naught in the glasses higher in the sky than I had expected sharing the same binocular field of view with the police station mast and security camera!. I set down the binoculars and glanced in that direction and I couldn't believe it, I could see the comet, complete with tail, easily with the naked eye!, even in strong blue twilight!. I was shocked by just how obvious it looked complete with Venus in the same naked eye view. Amazing!. This comet really was bright and I could only imagine what it would be like in a dark sky. With the naked eye I could see the orange stellar coma and short white straight dust tail looking like a cream-coloured biro (pen) hanging in the sky!. In B50 I could see a pearly white high surface brightness dust tail with slight curvature pointing to the west. I could even see the dark ''shadow of the nucleus'' feature which seemed to split the tail into two slender components. The tail was a high contrast feature, very well defined, and extremely bright against such a bright sky background. The tail issued from the coma at a 45 degree angle to the NW. The coma was planet-like, an orange/golden colour and highly condensed with sharp edges. At times it took on a brown/orange colour which was most likely an atmospheric effect. I could detect perhaps 1 degree of tail. In the ETX it was + 2' in diameter, planet-like, of a similar colour, very highly condensed and bright. I did not see the shadow of the nucleus feature in the scope however the tail was strongly curved as it left the coma. I took a large number of images (above) at ISO100, 1/20 sec exposure at 10X optical zoom. Focusing was easy because I could see the comet on the camera's LCD screen!. Soon clouds moved in and the comet was gone again and in good time to as the red battery light on my camera was flashing like crazy. 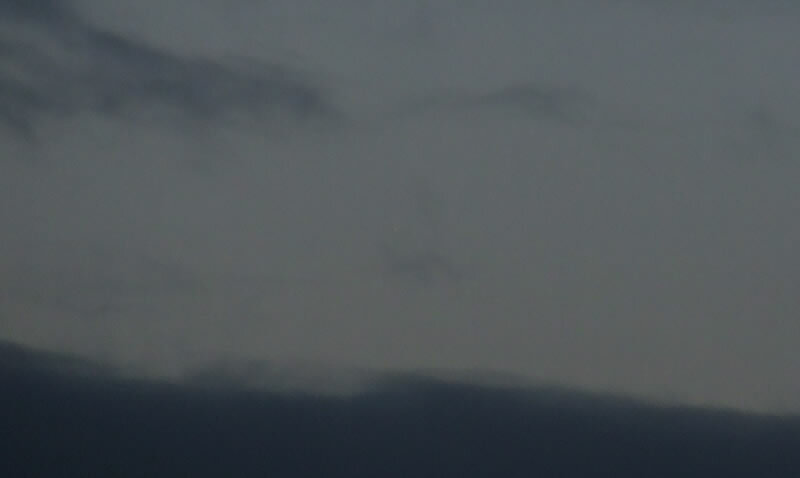 I watched Venus set, reddening as it got lower into the horizon murk, then ended the session at 17.35 UT. After eight attempts I had done it!. C/2006 P1 Mc Naught was my 36th comet and now the brightest comet I have ever seen in my life. I was delighted beyond words! It was overcast all night with the exception of Vega and a few other stellar gems which popped in and out through cloud, however I felt optimistic about seeing the comet again before dawn. I had been working on the website until 05.00 UT then managed to get some sleep until my alarm went off at 06.40 UT, and like a rocket, I checked the sky, which was cloudy then went back to bed again with the intention of staying awake however I accidentally fell asleep. The next thing I recall was my Mum's alarm going off at 06.50 UT and I shot up in a panic, another sky check revealed low clouds however it was clear at the zenith so I did the usual and rushed out the door, this time to my new elevated position on the site near a large grassy hill. It was clear, calm, periodic cool breeze, wet, muddy, 80% clear, T=8/10, however a very long dark agonizingly slow SE drifting cloud covered the sky where the comet would be rising at 07.20 UT. I could see Altair above the clouds which was a good sign. Icy rain fell on me several times but it soon stopped. 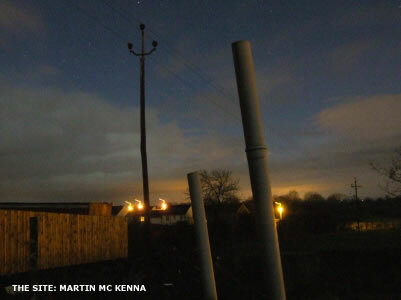 The eastern horizon was great, I could see the distant lights of planes leaving Antrim Airport however they where so far away that they did not hamper dark sky observation. The visibility was excellent!. With B50 I observed RCrB, TCrB, Antares, Altair, and Jupiter. The sky was getting bright fast so I scanned around that cloud bank with B50 while firing off numerous patrol images. The last quarter Moon was in the SW surrounded by a faint blue and pink corona within Virgo. After some time the sky was getting really too bright and I was just about to pack up when I had one more sweep with B50.  I found the comet!, I couldn't believe how low it was on the horizon (5 degrees above the land) and to the comet's west I could see the rosy-pink glow which marked the area where the Sun would soon rise. With the naked eye I could see Mc Naught as a gold/red star-like point with a 15' white dust tail with structure even in bright twilight. It amazed me how much it stood out in such stark contrast against such a brilliant sky. I estimated the comet at magnitude -1.7 however others placed it at magnitude -2.0. The comet hung stationary in a slightly tan-coloured sky with a subtle orange below. I could see that Mc Naught was above a distant telegraph pole in the foreground which served as a nice marker incase I lost it from view. In B50 the coma was a + 3' golden-red disk with sharp edges and very highly condensed. The high definition dust tail extended for 1 degree to the NE at a shallow angle with long dark ''shadow of the nucleus'' feature which could also be seen without optical aid. I set up the camera, focused on Jupiter, and with the comet visible on the LCD screen I took twenty images at ISO64-100, 1/15 - 1/10 sec exposure at 10X optical zoom of the comet against a clear sky with clouds above and below. 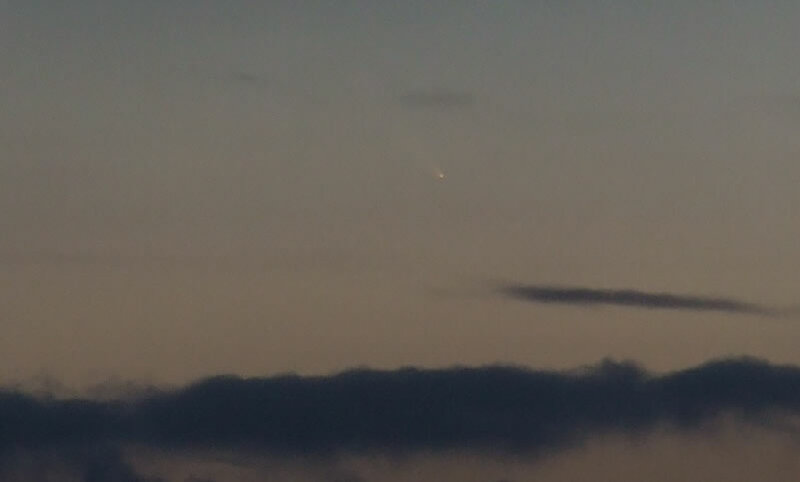 I spent five minutes with the comet until clouds moved in for the remainder of the morning. This was an unforgettable sight!, a great comet with planet Jupiter visible to the naked eye in a beautiful pre-dawn sky. I spent one hour to get a five minute view and it was worth it. This make two observations within 24 hours, not bad work. My alarm went off again at the usual time however the sky was not on cue this morning. It was overcast and had been a very bad night with heavy rain, clouds, and gale force winds which seemed to have subsided now. I went back to sleep again then awoke at 7.05 UT and seen that the sky was very clear so I went straight back to my location from the grassy hill. Periodic clear sectors, dark gray slow NE moving clouds which always seemed to accumulate on the eastern horizon, calm with breezy intervals, very wet, and muddy, T=7-8, last quarter Moon in SW with weak Corona in Virgo which shared the same binocular FOV with Spica. This morning was very different. 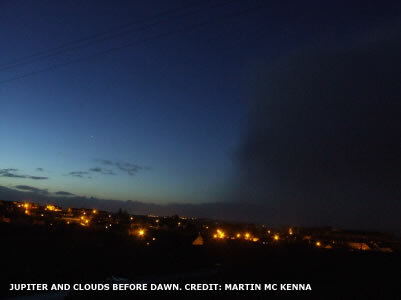 I could see numerous bright white cloud to cloud (i-c) lightning flashes illuminating the low cloud decks to spectacular effect, both in the north and south. I did the usual sweep for the comet but again clouds where a problem here so I ended the session at 08.05 UT. I really hoped to the see the comet tomorrow evening. Comet Mc Naught was without doubt a great comet at this time as several observers had succeeded in finding the comet during daylight above the Sun. 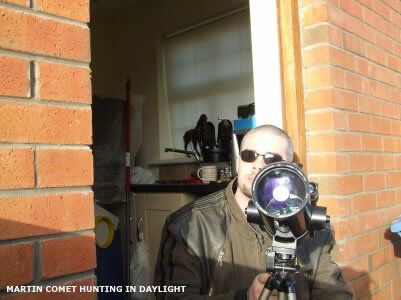 David Moore from Dublin was the first to make a daylight observation from Ireland so I was eager to try it myself. Only once before have I attempted to seek a comet beside the Sun in day time and that was C/2002 V1 NEAT (which I did not see) so I would try my best, because saying that you observed a daylight comet has got to be one of the 'coolest' things one can do as an observer. Today, using B50, ETX, and the naked eye, combined with sunglasses to reduce glare and increase contrast I made several exhaustive searches for the comet however unfortunately there was just too much moisture in the air which reduced the transparency to the extent that the sky around the Sun was white rather than blue. Seen very long crepuscular rays and several large 'CB's' from W to E. Windy, calm periods, with isolated gale force gusts, mild, wet, with heavy rain. Comet was 8 degrees N of the Sun and 16 degrees W of Venus. The sky was clear. By 16.00 UT I was ready and waiting for the Sun to set however time seemed to go very slow so I decided that I could wait no longer and left the house at 16.05 UT and set up at the site. The Sun was close to setting sporting several crepuscular rays which was not a good sign. As soon as that giant orange ball set I could see planet Venus emerge out from the twilight with B50 in near daylight. I scanned with B50 just over three binocular fields to the W of the planet and at 16.20 UT I found the comet. It was 16 degrees west of Venus and 8-9 degrees north of the Sun. The Sun itself was only 2 degrees below the horizon so the bright sky was almost like daylight!, I was amazed that I could see the comet again on the eve of perihelion. The sky conditions were not good at all due to moisture degrading the transparency and turning the sky white, the arrival of which was signaled by those crepuscular rays so the comet looked subdued. I could not see Mc Naught with the naked eye and even in binoculars it was diminished in glory due to its close proximity to the Sun. The comet looked like a tiny gold dart with a 2' gold highly condensed disk-like coma which was stretched in the direction away from the Sun. The tail was also gold coloured, visible for 10' and curved to the NW and was clearly split in two giving it the appearance of a chevron shape with a long gap in the middle. I obtained several images which was tough going due to the brightness of the sky which just showed the coma and no more, it was still a capture. This was my third and possibly final observation, what a strange looking form the comet was in the binoculars, very difficult to describe, almost eerie. Mag: -2.5 t0 -3.0 Dia: 2' D.C: 9 Tail: 10' NW. 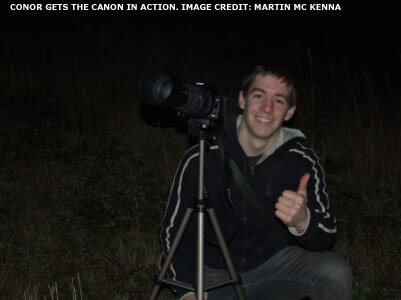 Conor and I had arranged the night before to meet up early in the morning to catch the comet. Our plan was to locate the comet as the Sun was rising and then observe it in daylight, a first for both of us and we were looking forward to the experience. 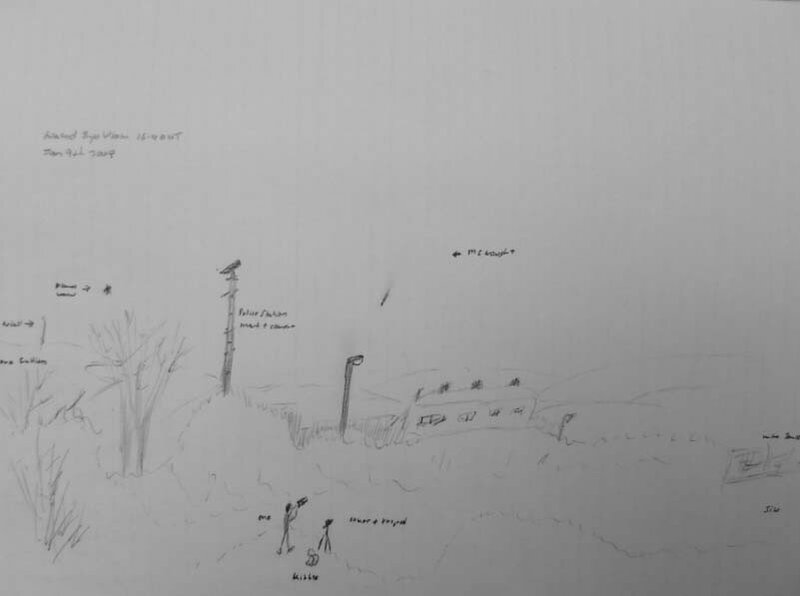 My alarm went off at 07.50 UT and it was hopelessly cloudy so I went back to sleep however soon after my mobile rang, it was Conor looking information on the comet's position and rise time so I told him, however in the background I could hear the morning breeze so I assumed he was already at the site. I changed and met him soon after. It was cloudy and wet with a cool gentle breeze and the only gap in the sky was located in the south where we could see the waning Moon against a blue sky. We had the tripods set up with cameras and binoculars which yet again got us some very strange looks from early morning walkers (people are so nosy at times) however the sky never cleared and the comet never showed. A while after the Sun rose we headed back home. Comet Mc Naught reached perihelion on Jan 12th and two days later due to the ''forward scattering effect'' the comet reached an incredible magnitude -6 to -6.5 making it a daylight object and the brightest comet since 1965 when Ikeya-Seki took the astronomy world by storm. 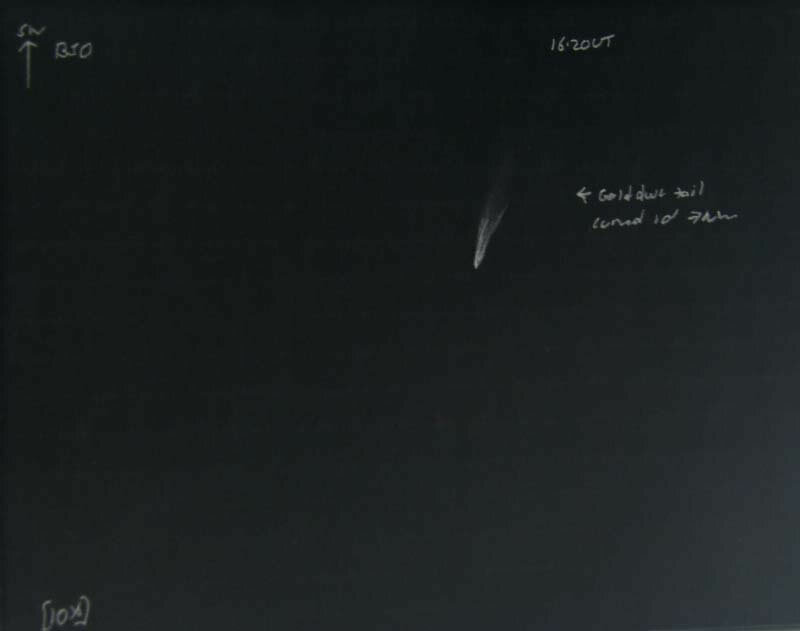 Many reports and images came in from around the world indicating that the comet could be seen beside the Sun with the naked eye complete with tail in broad daylight. This was incredible!. For three days in a row I attempted to find the comet in the daytime which proved a very difficult task again due to clouds and poor sky conditions. The Sun in January rides very low in the sky and even at mid day it was not well placed above the horizon which made things even more difficult. I tried my best using the usual gear as well as an 8.5" F/7 dobsonian reflector which John McConnell lent me for my own comet hunting programme while my larger main instrument was being refurbished, and I have to say that when I first used this scope at the same time last year I had no idea back then that in the near future I would be using it to track down a comet in the middle of the day!, amazing what can happen in one year. Unfortunately I never got to see the comet in daylight. Comet Mc Naught completed a hairpin turn around the Sun and headed south and with each passing day it got lower and lower in the sky until finally it vanished completely from the northern hemisphere. I would never see it again. Meanwhile for observers down under the comet appeared in the evening sky after sunset and climbed higher into the sky each evening when it became an absolutely stunning object sporting a gigantic peacock-shaped dust tail complete with countless bright striations and synchronic bands the likes of which have not been witnessed by anyone alive today. Images that appeared on the internet were truly astounding. Then just when I thought the show was over something amazing happened. 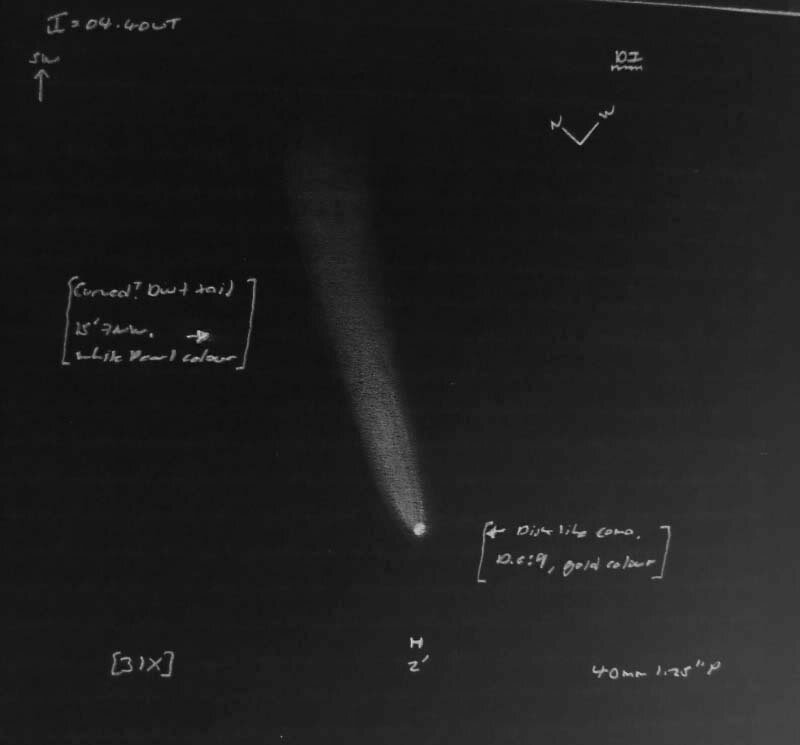 The huge steeply curving dust tail extended for over 80 degrees (160 Moon diameters) from the nucleus and soon reports and images arrived showing that the comets tail was visible above the horizon for observers in the northern hemisphere. On the next clear evening I would have a go at seeing this rare sight. Today was the first proper clear sunny crisp Winter evening for some time so I intended on taking full advantage so I packed my camera, B50, and tripod into my rucksack and left the house at 16.40 UT. I needed a very clear horizon so I began the one mile walk out to the county, my destination was the peak of the large hill where Conor and I had made our earlier patrol for the comet on January 1st. I set up my gear inside a lay by near the gate of a large field where I watched the Sun set through the gaps of a distant hedgerow at the field's perimeter. When the Sun finally vanished from view it left behind a wonderful view consisting of planet Venus in the south with the waxing gibbous Moon 25 degrees away to the planet's NE. The sky was painted a soft yellow-white pastel colour which looked glorious. It was calm and very cold after a harsh frost the night before and more was forming in the air already. I took a number of images of the Moon and waited for darkness to fall. The scenic peaceful view would not last long as trouble was a brewing above the northern horizon where a massive well developed Cumulonimbus cloud (CB) with anvil was moving in fast in my direction and behind it was thick cloud. I snapped an image which got me more strange looks from a local farmer who was feeding his sheep while driving a 4x4 over the frosty grass. In no time the CB was on top of me casting down thick sheets of rain, sleet, and possibly snow across the countryside and as soon as I felt the first icy splatters hit my face I knew I had no choice but to pack up and begin the walk home again. The journey home was cold and slow as I got soaked to the skin and the splashes of water sent my way by passing cars driving through roadside puddles did little to lighten my mood. I was wet, cold, and had seen no comet tail. After 20 minutes of walking I was getting closer to the warm sight of my house when suddenly the mood of the sky changed. The sleet stopped and the clouds suddenly parted and within 10 minutes the sky was crystal clear and in perfect shape. I never stopped at my home but instead continued walking to my usual spot up to the site which gave me a decent view of the SW horizon where the mighty tail of comet Mc Naught would be lurking when twilight ended. I set up my gear on several large rocky boulders and very soon the sky was very dark, even the glow of the Moon, complete with earthshine, did not hamper the sky much and very soon my eyes had grown accustomed to the darkness around me. 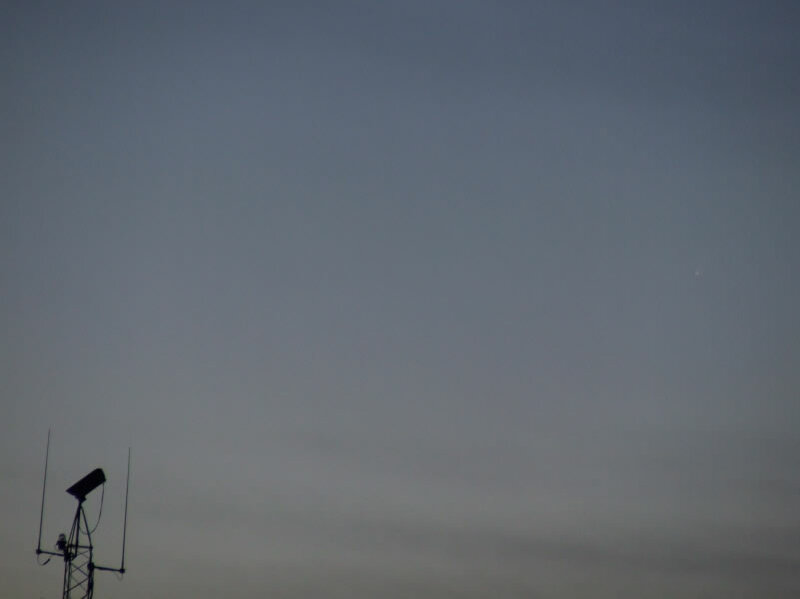 Venus was a nice sight beside the police station mast where only 13 days earlier I seen the comet for the first time. I watched the planet set behind a rooftop then began my search for the tail. Binoculars proved useless and my exposures with the camera were unlikely to get a result as I was only capable of a 15 second exposure which would not be deep enough but I tried anyway. The sky was perfect, although I could not see the zodiacal light due to the Moon. I relaxed my eyes and concentrated with averted vision then at 18.00 UT I struck gold. Extending upward from the SW horizon was a tall thin colourless ray of light which tapered to a point with high contrast sharp edges, then I saw two more fainter rays, one on each side of the brighter component shooting up through Aquarius and Pisces with their tips ending below the square of Pegasus to the SE of Enif. The cluster of three rays popped into view on three occasions before I lost them from view due to increasing air frost which began to reflect the town lights. Those short glimpses were all I needed, those three rays were the tip of the striations within comet Mc Naught's tail!!!. The comet was in the southern hemisphere getting watched by observers from Australia and New Zealand, yet here I was seeing the same thing from the northern hemisphere in N. Ireland!. It was then that it hit me, this was a very rare and precious sight which I may never see again in my life. The observation from here was difficult but just as spectacular in its own subtle way here in the north - unforgettable!. This was the first and only tail observation from Ireland that I'm aware of. This was the evening when preparation met opportunity!. Comet Mc Naught is now fading however its memory shall remain bright in my mind for eternity. I'm glad it graced our skies over 2007 marking the start of a fabulous new year in astronomy. During past epochs comets were feared and portended calamity, however for me this bright icy visitor, who was certainly not camera shy, marked the beginning of a new era in astronomy. 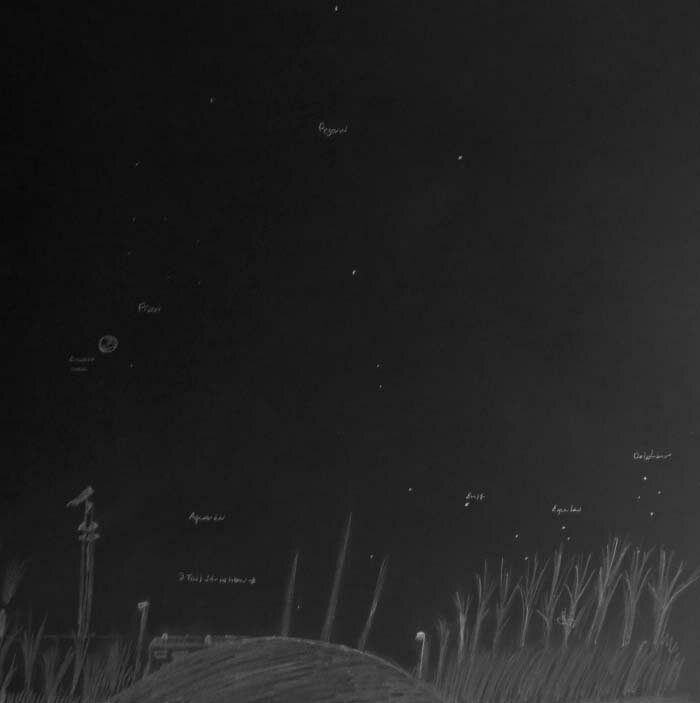 I sincerely believe that comet Mc Naught has opened a new chapter in the book of comets, a book which we can all read every time a new comet arrives in our skies. There will be other brethren of this comet waiting to be discovered very soon for us all to enjoy. It has been almost exactly ten years since I first set eyes on great comet Hale-Bopp back in 1997 and now I have seen another comet which has exceeded the magnitude of this past beauty. 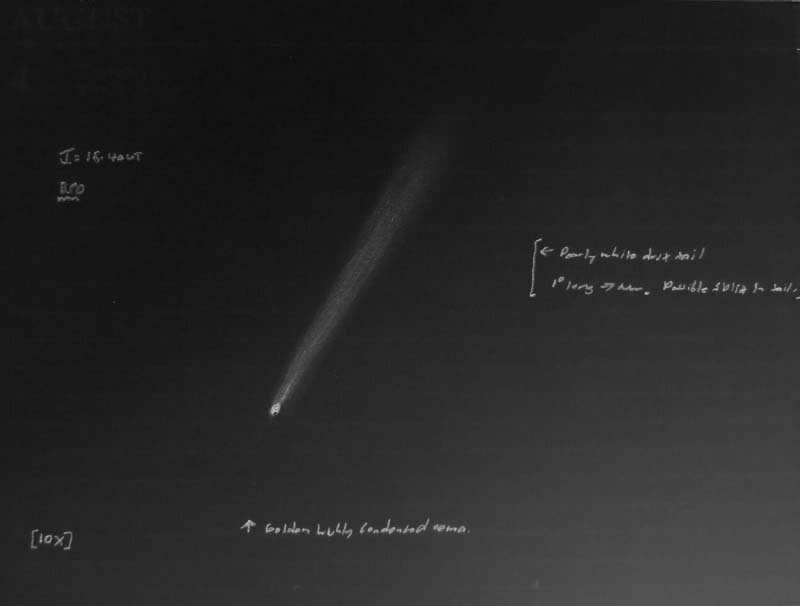 Mc Naught brought me back to that first comet sighting and it reaffirmed the reason why I spent so much time under the stars observing comets and seeking new ones. Thanks P1 Mc Naught. Since the excitement of comet Mc Naught I have been very busy indeed. Every day I was researching everything I could about this comet, examining every observation and image I could set my eyes on and updating the 'sky events' section of this website several times every day to cope with the latest news and comet fever which has grabbed the world. As webmaster of nightskyhunter I was inundated with emails from amateur astronomers and members of the public alike from all over the world who sent me in their observations, images, and poems made from homes, backyards, deserts, and even aeroplanes. I would like to thank each and every person for their contribution which has been very much appreciated. As far as I'm aware, nightskyhunter was one of the few, if not the only websites, which announced and expected comet Mc Naught to become a great comet via the 'Sky Events' section long before it became fashionable, so I'm more than delighted that the predictions have not only been meet, but exceeded. I have lost much sleep over this comet during the most active two week period I can remember, I have not been so busy since the tremendous Noctilucent Cloud season (NLCS) we had here during the Summer of 2006, a time when I invested a tremendous amount of hours to studying this phenomena while at the same time putting together Nightskyhunter which was busy work for several months. Nightskyhunter has accumulated a record number of hits thanks to McNaught. The various forums which I'm a member of have received the highest number of guests and visits since I can remember, the first hand eye witness accounts and images have been fabulous to read. McNaught has reinforced in my mind that comets are adored by the world and always will be, and that astronomers have still much to learn from these mysterious colts from the Solar System. When will the next great comet arrive?, I suspect sooner than he think!. Until then, happy comet observing.